did i reach my 2018 goals? Ladies and gentlemen, after taking a month long break for school she is finally back and indeed better than ever. She has replenished her creative fuels, she has gotten good grades and she is now more ready than ever to entertain via her socials. Hey :). It's true, I am back from the dead, I returned from the grave that actually wasn't a grave because if you follow my IG you know I was still alive all this time, to make content on here again. Yay!! 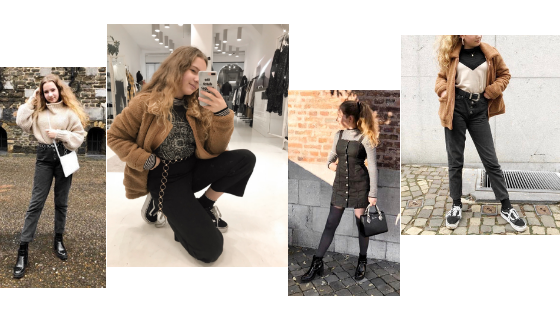 Anyways, I figured my first blogpost of the year would be a little look back into my 2018 goals and whether I've accomplished them or not. I always like reading these personal things, so I figured I'd do it as well. This actually did not happen, sadly. Mainly because of the costs of international shipping and whatnot. Every time I've had an idea for a giveaway worth like €50 the shipping ends up being €20 on top of that and that's just not doable for me atm. Maybe I can do a giveaway if I order something straight to the winner's house? Like for example, I give the Naked Heat palette away and use my one for the pics. Then when someone wins I go to the Sephora site and enter their address and my card details so shipping doesn't end up super expensive. I think that could work, but I'm going to look into it more to be sure. This DID happen!! I actually put together 22 youtube videos on my channel during the year :). Most of them didn't age too well in my perfectionistic eyes lmao but I'm still very proud that I made them. It's not a lot, but Youtube was never intended to be my main focus. I've definitely found a style of youtube video I like to watch and want to make more of, but I think I'll update y'all on that in a separate blogpost. Gotta keep some tension going ;). I accomplished this, but I still don't cook as often as I would like to :). In the future I definitely want to look into cooking vegan and/or vegetarian / pescatarian more often, because we need to save the planet somehow, am I right ladies and gents? My favorite recipe of the year hands down was my own pho recipe that I perfected after a few times... it's soooo good and quick + easy to make. Will definitely be a staple for me once I go to college lol, mainly because the ingredients are cheap. I'm thinking of sharing the recipe on here as well, so keep yo eyes peeled for that coming soon. This happened!! I actually worked with a phone case site on a post that I actually really liked :). Aside from that I haven't had any other sponsored posts. I have been approached by a few brands for writing sponsored posts, but with most of them I found out after a quick google search that they were a massive scam or they wanted me to buy something (and let's be honest, why would I buy something to promote your brand? What's in it for me?). I would definitely like to do more sponsored stuff, so def don't be afraid to reach out to me if you want to sponsor me :). This happened!! I actually elevated and developed my style to a point where I'm super satisfied with it! It's definitely merged to be more streetwear / edgy / skater girl -ish (which is ironic, since I'm not "street" at all). I think the fact that I don't have to worry about clashing colors has really given me space to just combine things and see where it goes. Throughout the year I kinda just let go of all the "what if's" and just wore what I wanted to wear, without caring if people thought it was extra af (which they def thought it was lol). Now I'm comfortable in my sometimes "bold" style choices and have pinpointed the things I want to work on and the direction I want to go in. Very happy :). This didn't really happen in the sense that I kept up with a traditional bullet journal. I have however kept an art journal in which I painted / collaged / wrote / sketched my heart out, so I guess that counts as well. I think the concept of the bullet journal is not suited for me, as it requires a lot of input for which I simply don't have the time. But not to worry, as I already said, I found many other ways to creatively stimulate myself throughout 2018 like film photography, painting, drawing and sketching, writing poetry and making youtube videos. I think that's what I really wanted to achieve with this goal, to just be able to have more creative outlets and I actually achieved that, which I'm proud of :). This happened!! I went to a lot more hipster-ish places with friends, which was the goal all along. I discovered some cute coffee places, a cute smoothie bowl place and some cute stores, among other places. I did this, except maybe looking back at it, it actually seems like less than it is. 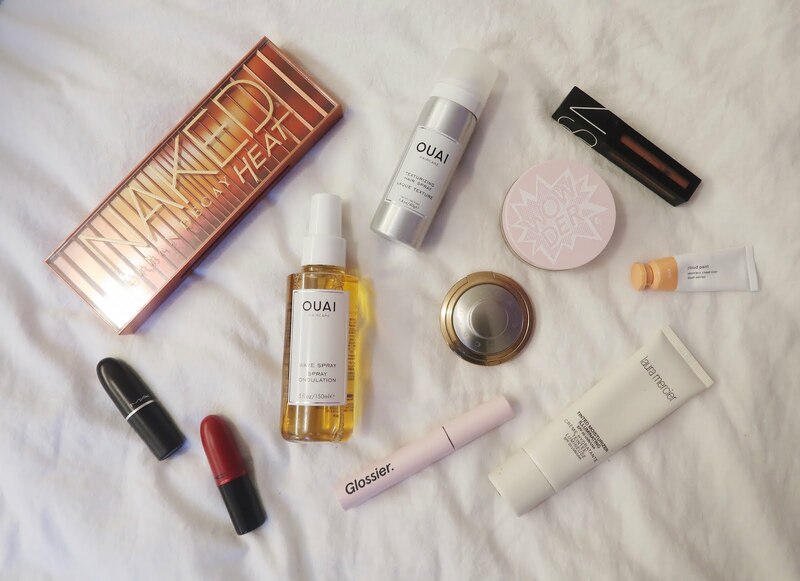 All and all I discovered a lot of holy grail products, like the OUAI wave spray, Laura Mercier illuminating tinted moisturizer and the Glossier lash slick mascara which I will definitely be repurchasing over and over. In the end, that's what it's all about, discovering new things that can become staples in your routine. Some of the high-end beauty products I discovered throughout 2018. And that was it for this post! The year flew by, didn't it? In terms of 2019 goals I'm actually going to writing a separate post on that, so stay tuned. Thanks for reading and I'll see ya next week :).